Based in British Columbia, West Coast Amusements is the largest Canadian midway operation in Western Canada, and one of the few that remains family operated. West Coast Amusements has 125 rides, employs 500 staff at peak season, and has four traveling units. From April to September, these four units coordinate to set up and operate more than 100 fairs and rodeos across Canada and into the Southern U.S. West Coast Amusements also contracts services and equipment for large gigs such as Vancouver’s Pacific National Exhibition and the Calgary Stampede. And it is all run from the Hauser family line, and started 83 years ago with Bingo. Irvin R. “Bingo” Hauser was born Oct. 17, 1926 in Warsaw, Poland. Less than a year later baby Irvin moved with his parents and family to Canada settling in Brandon, Manitoba. Even as a child, young Irvin was always a hardworking entrepreneur, doing any kind of odd jobs, paper route, and selling pots and pans. Bingo traces his passion for the carnival life back to the 1930’s. At this time, in Manitoba, where he grew up, the Barnum & Bailey Circus would come through his hometown. Bingo would peel potatoes, or do whatever other small jobs that needed done. In 1942, at age 16, Bingo stepped into the business. As his experience with the carnival industry grew, so did his skill and talent in the business. 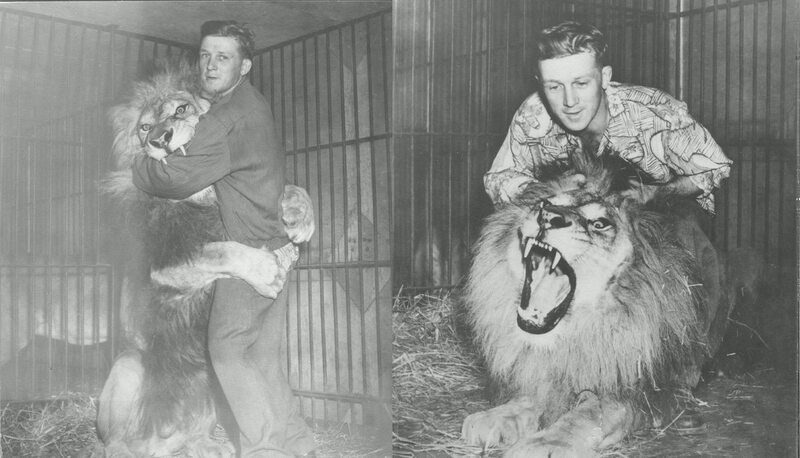 He operated a number of rides and concessions before going out on his own with an animal show. At first the show only consisted of a few monkeys and two lion cubs named Simba and Jackie. He began his lion taming act with Simba. Eventually, Bingo bought a merry-go-round and soon had a growing menagerie of animals, including a bear, an alligator, and an anaconda. Simba became the star of Bingo’s show. He was beloved by Bingo and their fans, and his depiction is now immortalized in the West Coast Amusement logo. While working a gig in Vancouver, Bingo met a young woman named Jacqueline Christmas, whose parents operated a cotton-candy booth at Shrine Circus shows. This would be the beginning; in 1962, Bingo founded West Coast Amusements. In the 1970s, the midway became a large draw, and Bingo made the difficult decision to placed his animals in the Calgary Zoo. Together Bingo, Jackie, and many members of their extended family built West Coast Amusements into the world-class carnival operation it is today. West Coast Amusements is located in Chilliwack, BC and continues to grow with pride.